Our visit with Caleb comes to an end today, but there are a few more reflections I’d like to share. Where does Caleb want as his inheritance? The hill country. That shouldn’t surprise most of us as we all love the hills and beauty of the mountains. But I don’t really think that’s why Caleb longed for this territory. Yes, he’d seen it before and gave a glowing report of the area 45 years or so earlier. He’d not forgotten what he’d seen there – and he longed to see it again. It had captured his heart and mind for four-and-one-half decades. But I think there are possibly deeper reasons for Caleb’s desire for this place. But first, think about it for a minute. Caleb was 85 – get that and let it settle in – eighty-five years old! In order to take that hill country, what must you do? FIRST: you must overcome the fear of the giants, the descendants of Anak, who lived there. Those very people had terrified the 10 spies 45 years ago and no one had yet routed them from their land. Yet Caleb wasn’t afraid. Why? The rest of the world looked at the giants there and said, “No way! We’d be slaughtered!” The Israelites looked at one another and said, “We’re like grasshoppers in their eyes!” Caleb looked at them and said, “They’re nothing compared to God!” It all depends on our focus, doesn’t it? SECONDLY: to take hill country, you must attack uphill – and that, my friends, is the recipe for a military disaster. Yet Caleb’s 85-year-old heart and legs were crying out for just one more challenge – one more charge against the greatest of odds. He didn’t want to settle down in the lowlands and live a life of ease! He wasn’t afraid of the giants at the top nor discouraged by the steep slopes. As far as he was concerned, the victory was already won because God has promised it! He wanted one more adventure with God before he was finished. How hungry are you for adventures with Him? I think when he first saw it, he fell in love with the place. Who wouldn’t, after 400 years of slavery in Egypt and the hot burning sands of the Egyptian desert! Here was lush green, fertile land and beauty. But I think there were far more significant reasons he may have wanted the hill country. I think he wanted the younger generations to learn something from the impending victory over the hill people giants. He wanted them to see and understand that nothing is ever impossible for those who have God’s promises in hand. They’d heard stories of the giants that terrified their parents and grandparents leading to the wilderness wandering. And here was an 85-year-old man with enough courage to take them on..uphill. This generation needed to learn from the older generation. And the younger generations today need to learn from us who are older. But that puts the onus on us, doesn’t it? What kind of example are we setting for them? Are we just getting old and long in the tooth and therefore we have quit attacking hills and giants when the Lord has said we should charge up the hill? Are we content now to settle into a pew and snooze quietly into the sunset? Our giants today are cultural and moral giants, but they can be defeated as surely as Anak’s descendants. No matter how old you are, you can still teach those who are younger about God’s faithfulness and goodness, about how He rewards the courageous who step out on His promises boldly with attack uphill, even in their old age. There is great power in an enduring witness of a life lived well to the end! There’s an interesting historical note here. Many years after Caleb died, the hill country was still in the possession of his descendants. And finally, a young shepherd king rose to the throne of Israel and put his first capital in Hebron for a number of years. This was the land Caleb had conquered! Why did David choose Hebron? It was partly because of Caleb’s actions around 400 years earlier – it was conquered and secured territory. Jerusalem was not. Why? Because the hearts of the Israelites had grown faint again after coming into the Promised Land and they’d failed to remove the inhabitants of the Jerusalem area. It fell to David to take possession of what would become the new capital, Jerusalem. One final thought before we say goodbye to Caleb for now. I was reading about endurance runners in Sports Illustrated and one of them made this comment (paraphrased): Endurance isn’t so much a matter of the legs – it is a matter of the heart and the mind. Let us not think about the age of our limbs or the decades of our service to Christ, but rather about how we can finish well, like Caleb; of our how hearts can rise to a new challenge even now and how we can bless the younger generations as we do. I don’t know about you, but I sure am looking forward to meeting Caleb who surely must be one of the most neglected heroes in the Bible! PRAYER: Oh, God, how amazingly wonderful you are! Thank you for such a shining example that Caleb has set before us! Give us hearts and minds to rise to the challenge for as long as we live! In Jesus’ name, Amen. The hill country of Israel. I heard an interesting sermon on Sunday about conviction, and I thought that some of the points were worth sharing, so there’ll be several DayBreaks about it this week. First, a bit of background. You recall the story of the spies who were sent into the Promised Land to spy out the land. Twelve were sent – and twelve returned, but there were radically different reports given by two of the spies named Joshua and Caleb. We normally think of Joshua as having been the older because he became the leader, however in Joshua 14, we learn that Caleb was 40 years old at the time he went into the land to spy on the Canaanites. Most believe Joshua was perhaps 17-25 at the time, though we don’t know for sure. What prompted Joshua and Caleb to come back with a different report? That’s a good question. 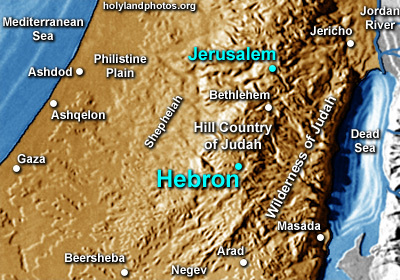 There is a rabbinic tradition that says that one night while they spies were in the land, Caleb arose in the darkness and traveled to Hebron (where the giant descendants of Anak lived) and went into the cave where Abraham and the patriarchs were buried (Numbers 13 does say they went to Hebron.) While there at the cave, he had an encounter with the God of Abraham, Jacob and Joseph that filled him with the conviction about God’s promise to the patriarchs that the land of Palestine was to be theirs. I don’t know about the veracity of that rabbinical legend, but something stirred Caleb’s heart with conviction. In Joshua 14 starting with verse six, Caleb, at this time a man of 85 and most likely the oldest man in Israel (since only Joshua and Caleb who were alive when Israel left Egypt survived the wilderness wandering) approached Joshua. Because he was the oldest man in Israel, people would listen to him. And he reminds Joshua about what the Lord told Moses about Joshua and Caleb 40-45 years earlier. Basically, Caleb reminds Joshua about how Moses had promised him the land on which Caleb had just walked. Here’s the point for today: Caleb came back from the spying mission ready to go to war and take possession of the land. If you read his report he is full of courageous conviction about the ability of Israel to take the land. But ten of the spies reported that the band of spies were like grasshoppers to the giants in Palestine. Therein, you see, is the problem. They were convicted that the people of the land saw them as tiny, puny and weak. But, at various points in the story, we are told that the people of Palestine were shut up in their cities because of fear of the Israelites. The ten spies were convicted and convinced by what they believe the inhabitants of the land thought of them. Joshua and Caleb (and Caleb seems to be the spokesman for the two of the spies who brought back a favorable report) was convicted and convinced by what God had said and promised. Maybe you need to think about what you believe about yourself. You may think that you are weak, insignificant, powerless, puny and tiny because someone in your past has mocked and ridiculed you to no end. You may have yielded to the whispering of Satan in your ear that you’re too small and weak and sinful to ever be strong and courageous. Who are you going to listen to? What others (including Satan) have said about you, or to what God says about you when He calls you His child, His beloved, that there is now no condemnation for those who are in Christ Jesus? Where will your conviction come from? PRAYER: God, I thank You for courageous people like Caleb who remembered Your promises in the face of 6:1 odds and who stood on the courage of his convictions about Your faithfulness. For all those who are being convicted by the words others may say about them, I pray that they will hear Your words of love and worth when they are under attack and that they will be convicted by what You say, and not what anyone else says. In Jesus’ name, Amen.